Demand for rubber products in China will grow 8.8 percent per year to 740 billion yuan in 2017. Gains will be supported by healthy growth in manufacturing, especially in industrial machinery and motor vehicles. Tires will remain the largest product segment as income levels continue to rise and create greater demand for higher-priced tires. 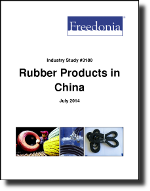 This study analyzes the 485 billion yuan rubber products industry in China. It presents historical demand data for 2002, 2007 and 2012, and forecasts for 2017 and 2022 by product (e.g., tires, industrial rubber products), market (e.g., industrial machinery, motor vehicles, aerospace equipment) and region (e.g., Central-North, Northeast, Central-East). The study also considers market environment factors, details industry structure, evaluates company market share and profiles 37 industry suppliers, including Cheng Shin Rubber Industries, Hangzhou Zhongce Rubber and Giti Tire.